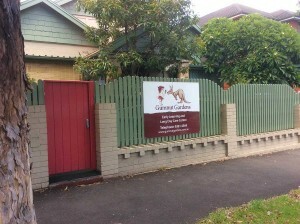 Gumnut Gardens opened its doors in November 2009. Our first children were the daughters of two staff members. From that small start, we rapidly grew in 2010 to fill the infants, toddlers and pre-school rooms. The son of the owners of the Centre was among the first children to attend the Centre – he still loves to visit and remember his happy times there. We are located in an old sandstone and brick building in Moore Park Road Paddington/Centennial Park which features original features such as wooden jarrah floors, high ceilings, window seats and a fireplace. Our building was built over a hundred years ago and was converted for use as a childcare centre in the 1990s. Our name “Gumnut Gardens” was inspired by the work of May Gibbs (1877-1969) who wrote the iconic Australian children’s classic story “The Complete Adventures of Snugglepot and Cuddlepie” and who was a relative of one of the owners of the Centre. May’s work also inspired our logo and our choice of the flowering gum (corymbia ficifolia formerly known as eucalyptus ficifolia) with its lovely soft pink flowers, distinctive gumnuts and aromatic leaves to grace the entrance to Gumnut Gardens. Information about May Gibbs and her harbourside home “Nutcote” is available at www.maygibbs.com.au.